he tried to keep as close as possible to the ground (this was called "playing-low"), so as to get in under the bull's horns, the Bulldog's short forelegs (6) and out-turned elbows (2) facilitating this. If he failed in his objective, he ran great risk of being furiously trampled upon or the bull might succeed in slipping his horns under the dog's belly, and send him soaring up into the air. backs, will ribbed up (1), stood the best chance the survive when falling back on the ground. 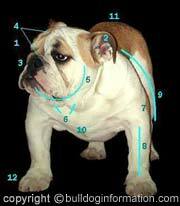 The Bulldog's muscular thighs and hind legs, which were long in proportion to the forelegs (11), as well as the placement of his stifles, hocks and pasterns and his arched loins, allowed him to spring up to reach the bull's head, when it went up in a vain attempt to place it out of reach of his assailant. 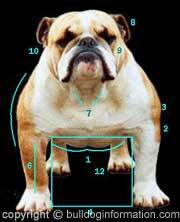 Moreover, the bulldog's light hindquarters, small tucked-up belly, and shapely cut-up all played their part by relieving him of useless weight. is still rightly accounted a very serious fault. The reason for this is that, the larger the head the greater the area for the attachment of those all-important muscles that actuate the jaws. The typical lay-back (1), with the consequent recession of the nose (3)allowed the dog to maintain his hold without impeding his breathing. If the jaws were level and the dog down faced, the rapidly swelling portion of the bull's flesh on which the Bulldog fastened, as well as his own upper lip, would be pressed against his nostrils; he would be unable to breathe freely and would soon be compelled to let go. they reached the dog's flews and chops, where they combined with this own sweat and saliva and dripped away from the extremities. This is the real purpose of the flews, and they are always more pronounced on animals that, like the Bulldog, were originally bred for battle. This was more likely to happed in the case of very heavy dogs and particularly those which were "beefy" in their hindquarters, when they should have been "comparatively narrow at the loins", as the British Standard states. 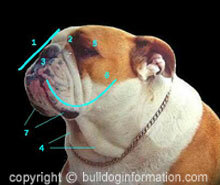 The large head that the Standard requires, but which some believe to be the cause of so much trouble and mortality at parturition, has always been regarded as an essential Bulldog feature. 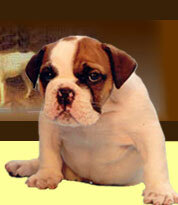 In subsequent revisions of the Standard the weight of the Bulldog has been raised. Surely this is a serious mistake and it is to be hoped that this is not merely the prelude to a further upgrading! Very heavy dogs are quite unsuitable for bull-baiting, as our ancestors were well aware. It is not only that they lack agility; excessive weight would almost certainly cause the flesh to which the dog fastened to be torn away, the heavy animal caming down 'plomp' after having been tossed maybe thirty or forty feet high. In conclusion, if we have correctly interpreted the Standard in its relation to bull-baiting, we may say that a judge will not go far wrong in placing the exhibits after he has examined them carefully in the light of the four following questions: "Is the head correct?" "Are the eyes dark?" "Is the tail according to Standard?" and, "Could this dog bait a bull?" It is no use retorting that he will never be called upon to do so. He could only do so if the conforms to the Standard. 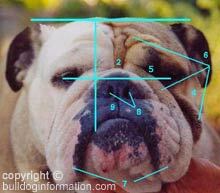 The New Complete Bulldog, by Col. Bailey C. Hanes. It not infrequenly happened that as the bull shook and tossed his head in frantic efforts to dislodge the aggressor, the piece of flesh that the dog had gripped was torn bodily out and the Bulldog fell with it to the ground, only to find retribution under his adversary's hoofs.